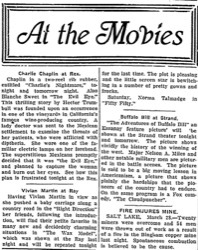 Chaplin in a two-reel rib rubber, entitled "Charlie's Nightmare," tonight and tomorrow night. Also Blanche Sweet in "The Evil Eye." This thrilling story by Hector Trumbull was founded upon an occurrence in one of the vineyards in California's famous wine-producing country. A lady doctor was sent to the Mexican settlement to examine the throats of her patients, who were afflicted with diptheria. She wore one of the familiar electric lamps on her forehead. The superstitious Mexicans promptly decided that it was "the Evil Eye" and planned to capture the woman and burn our her eyes. See how this plan is frustrated tonight at the Rex. 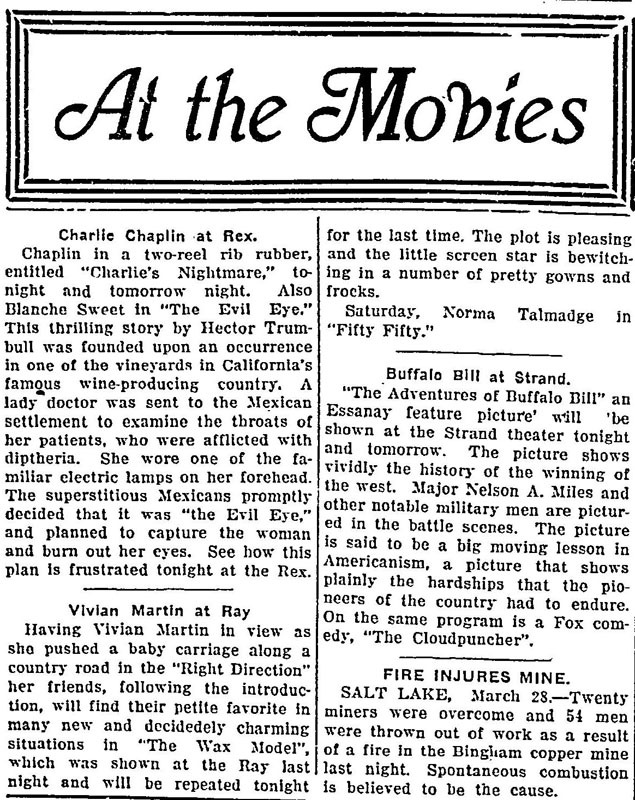 Having Vivian Martin in view as she pushed a baby carriage along a country road in the "Right Direction" her friends, following the introduction, will find their petite favorite in many new and decidedly charming situations in "The Wax Model", which was shown at the Ray last night and will be repeated tonight for the last time. The plot is pleasing and the little screen star is bewitching in a number of pretty gowns and frocks. Saturday, Norma Talmadge in "Fifty Fifty." "The Adventures of Buffalo Bill" an Essanay feature picture will be shown at the Strand theater tonight and tomorrow. The picture shows vividly the history of the winning of the west. Major Nelson A. Miles and other notable military men are pictured in the battle scenes. The picture is said to be a big moving lesson in Americanism, a picture that shows plainly the hardships that the pioneers of the country had to endure. On the same program is a Fox comedy, "The Cloudpuncher". SALT LAKE, March 28. — Twenty miners were overcome and 54 men were thrown out of work as a result of a fire in the Bingham copper mine last night. Spontaneous combustion is believed to be the cause.